On this day the 16th Ohio, on board the steamer Luminary, moved up the Mississippi River toward home, passing Napoleon, Arkansas, about noon. At about this time, the steamboat broke a propeller shaft when they were near the mouth of the Arkansas River. 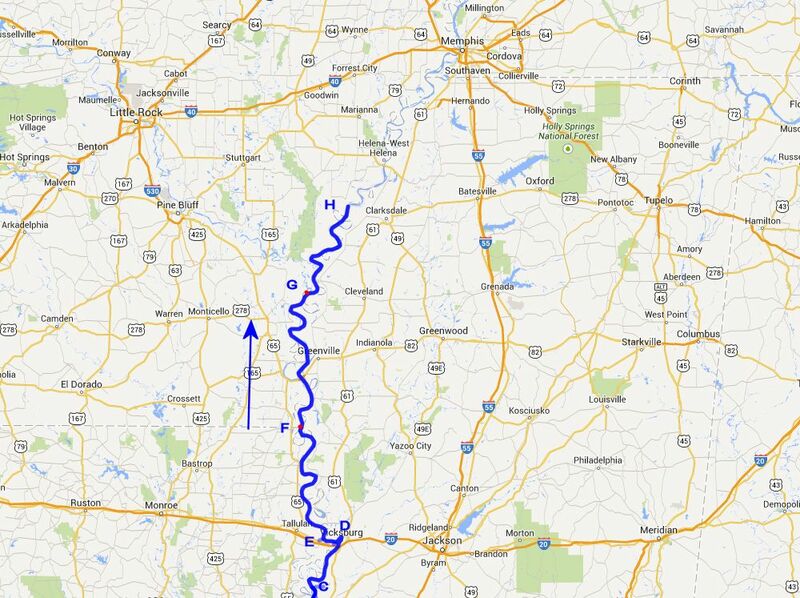 Repairs were made and they were under way again, reaching a point about four hours south of Helena, Arkansas, by midnight. Having started their journey home to Ohio late on the night of October 6, 1864, at Morganza, Louisiana, this period map shows the approximate route of the 16th Ohio on board the steamer Luminary, and the farthest, approximate position they reached on October 9, 1864. Modern day map showing the approximate route and location of the 16th Ohio on their voyage home from the war. C - Approximate point which the steamer Luminary reached about midnight on October 7, 1864. D - Vicksburg, Mississippi, where the Luminary stopped for several hours on the morning of October 8, 1864. E - Milliken's Bend, Louisiana, which the Luminary passed about noon on October 8, 1864. F - Approximate point which the steamer Luminary reached about midnight on October 8, 1864. H - Approximate point which the steamer Luminary reached about midnight on October 9, 1864.